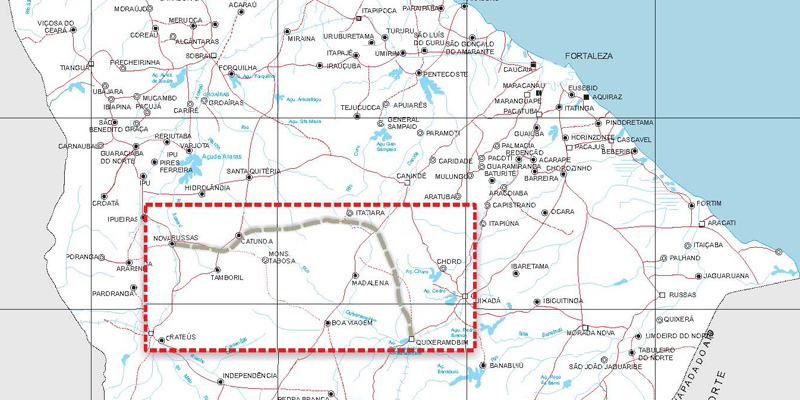 Development of the Railway Instalation Project of Transnordestina, Crateús – Piquet Carneiro Section, through the municipalities of Nova Russas and Quixeramobim, both located in the Ceará State, with resources of the National Department of Transport Infrastructure (DNIT, in portuguese) and Infrastructure Secretary (SEINFRA, in portuguese) of the Ceará State. The Railway Project of Transnordestina, relative to the section Crateús – Piquet Carneiro, will connect the municipalities of Nova Russas and Quixeramobim, aiming to meet a transport demand of goods that crosses the state of Ceará and have destinations to the states of Maranhão, Piauí, Paraíba, Rio Grande do Norte, Pernambuco and Alagoas, almost totalizing all of the states in Brazilian Northeast. This project has federal and state resources of DNIT and SEINFRA. Budget and execution plan of the works. Therefore, in addition to the conception and construction engineering projects, expropriation project and environmental studies were also developed aiming to ensure the environmentally responsible implementation of all engineering activities as well as to comply with the legal obligations of the proposed project.